Yoga is the practice of harmonizing the body’s inner currents (principally the currents of Feeling, Thinking, Willing, and Acting) until they are in perfect balance. Normally yogi with calm of mind focus awareness at the ajna center, half an inch above where the eyebrows join, and direct awareness to move through that center into a super-conscious state. At that state the individual life, the ephemeral, meets and fuses with the timeless life. Yoga meditation is not a fleeting activity, and the purity of life required to do yoga meditation properly requires more time and effort than most people are willing to give. However, with dedication and continual application, men and women who become true yogis will live in abundant well-being and universal harmony. When talking about yoga, a number of questions typically arise. Let’s discuss some of the more common ones we often hear. Yoga, as practiced at Springs Yoga, is not a religion. You will find people of many different beliefs in each class, brought together by a common desire to live in a more balanced, integrated, peaceful, energized manner without the daily stress of modern life. Well, what is Yoga as practiced at Springs Yoga? In its broadest definition, Yoga is a 5000 year old science of personal development that cultivates growth through ethical and moral discipline, posture and breathing, mental focus and meditation. It is exercise, stretching, and can be more than that. With practice, Yoga can heal your back, your body and your mind. I am very stressed because of my job, will Yoga help me with that? At Springs Yoga Studio, we emphasize deep, complete breathing. This has a direct effect on calming the nervous system and releasing muscular tension with the mind and body. I am very out of shape, and not at all flexible. What effect will this have on me as far as my classes go? At Springs Yoga Studio we encourage students to begin at their own pace, and give themselves respect and appreciation for being in the class. We encourage you to “go to the edge”, but not cross it and injure yourself. The way we teach encourages each student toward greater self-awareness, health, and balance. How is Springs Yoga Studio unique? Springs Yoga Studio presents a blend of classes that focus on the health of the back, and the healing power of breathing. Springs Yoga has classes at 23 different time slots seven days a week. Begin NOW! Yoga I class is recommended for those new to Yoga or who want a deeper understanding of postures, although all are welcome. Visit the Class Schedule to see a complete list of all upcoming classes. I can only come once a week, will I benefit? Yes. Daily practice is optimal, but once a week is better than not at all. Perhaps after you experience how renewed your body feels after a few sessions, you will be encouraged to practice more often. Come barefoot and wear comfortable exercise clothing. Will Yoga help with other athletic activities? Professional and Olympic athletes have directly benefited from the practice of Yoga. Yoga supports all other forms of physical activity by preventing muscle soreness and injury and also helps improve flexibility, strength, concentration and balance of mind and body. The experience of pregnancy and childbirth are enhanced by Yoga. If you are accustomed to regular exercise, any of the classes at Springs Yoga might be suitable through the first trimester. If you are new to yoga, Yoga I would be a good place to begin. Always check with your doctor before beginning any new physical program. How will I most benefit from Yoga? 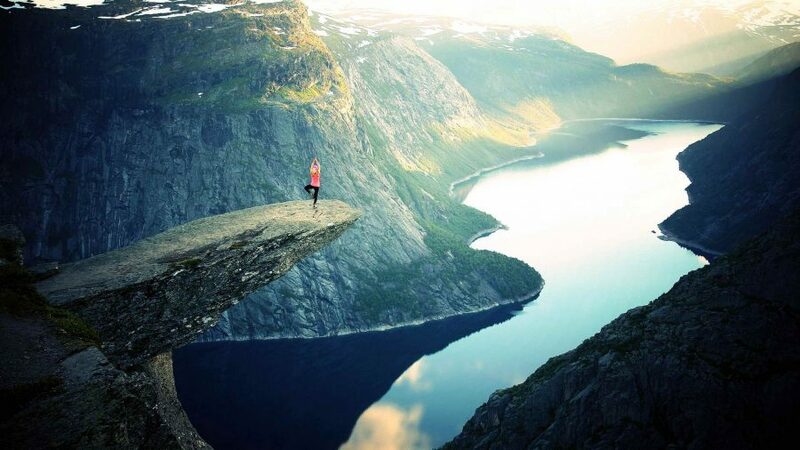 Yoga’s greatest affect is on the mind. As a result of your practice at Springs Yoga Studio, you’ll experience greater calmness in your daily life. Yoga is also a complete health maintenance system for the body. It has the ability to help you tone and lengthen muscles, lose weight, relieve back pain, improve circulation, purify your internal organs, and release tension to free the nervous system from undue stress.